The 3rd edition of Revelations opened to the public yesterday in Paris…and it is well worth a visit! 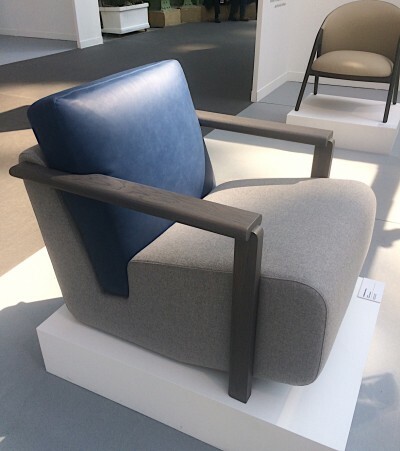 With 380 exhibitors showing exciting contemporary work, the focus of the fair is firmly on the dialogue between the designer and the artisan, and the key role craftsmanship plays in creation. The conversations I had with several of the exhibitors were so exciting and informative as they were keen to speak about the process of creation. Chile is the Country of Honour this year at Revelations and the contemporary creations of 24 Chilean craftworkers are exhibited. 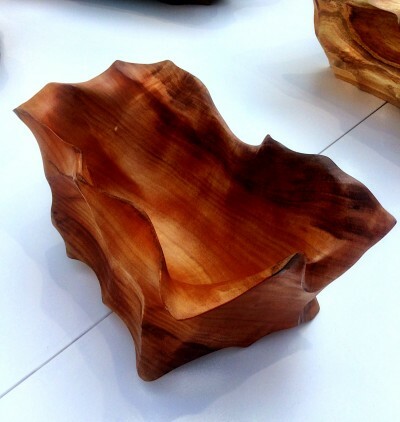 I loved the woodwork of Egon Munoz Quezada and was lucky enough to speak with him yesterday. 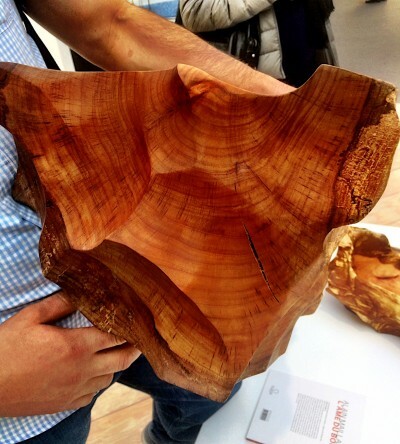 Hailing from Pucon in the region of l’Araucanie in Chile, Munoz Quezada explained that he only works with fallen wood and never cuts down trees. He finds many of the trunks with which he works on the beds of the numerous lakes in the area – the water levels decrease during the summer months so he can access them. 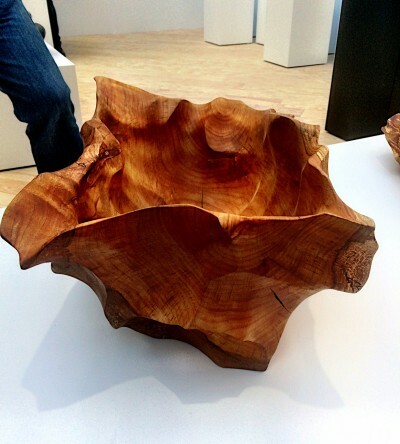 He then cuts the trunks with an electric saw (the only part of the process using a machine), dries the wood, carves the forms by hand with a spoon-shaped lathe which he has designed and had made, sandpapers them and finishes the pieces with wax and oil. All this work is done by Munoz Quesada and his wife. The work is so incredibly beautiful and organic and the woods are indigenous to the area (Coique and Rauli). I found his approach inspiring and the work spectacular. Definitely an artist to watch! I also spoke with Atelier Ludwig & Dominique whose pieces are gorgeous. They work with a stable of craftworkers of the highest caliber and stressed the importance of having each artisan at the same top level in order to maintain the homogeneity of each piece. Verrerie Bernard Pictet who collaborates frequently with the company was showing some beautiful pieces. 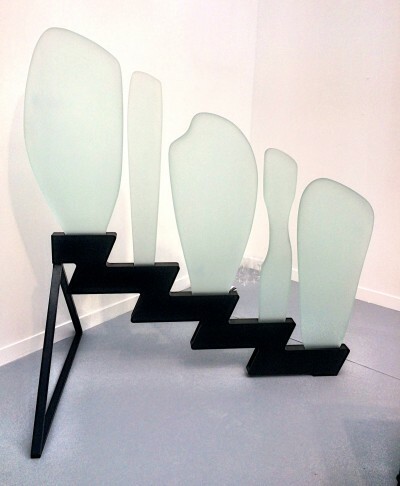 He told me that this ‘Rampe Barbara’ stair rail (image above) was inspired by the work of Barbara Hepworth and this can be clearly seen in the shapes of the reinforced glass. 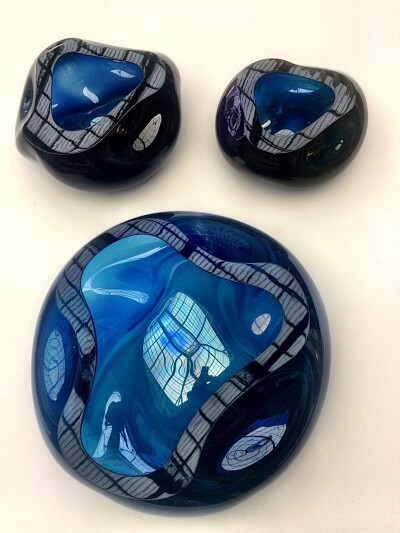 It was technically challenging to maintain a uniform line at the top of each piece of glass but as Pictet said, “the excitement lies in the challenge”. 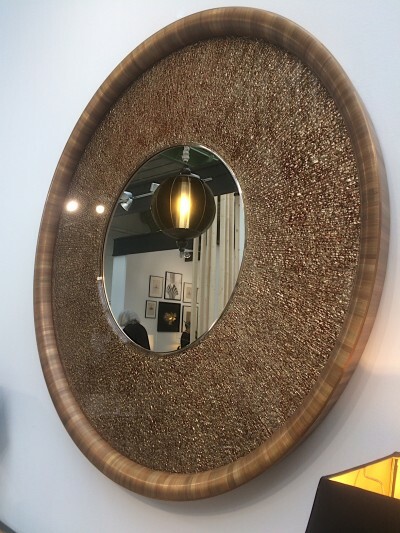 Ludwig and Dominique were also presenting this beautiful mirror in hammered glass with gold leaf and straw marquetry. 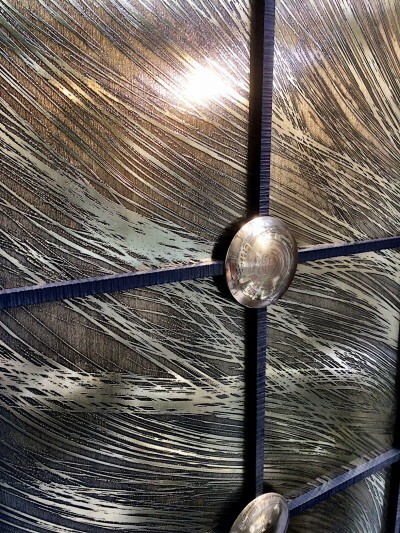 The collaboration of the artisans works beautifully as Pictet worked on the glass sections and the straw marquetry was created by an artisan specialized in this field. This creative collaboration is so inspiring. 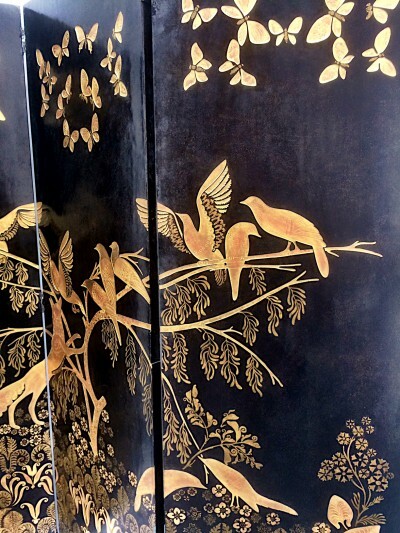 This magnificent screen in wrought iron and bronze was one of the first pieces Franck Chartrain made (2005). Mr Chartrain and his charming wife Angelique were on the stand and happily explained that the feather pattern on the bronze panels and the bronze studs was painstakingly etched by hand, and so of course the piece is unique. 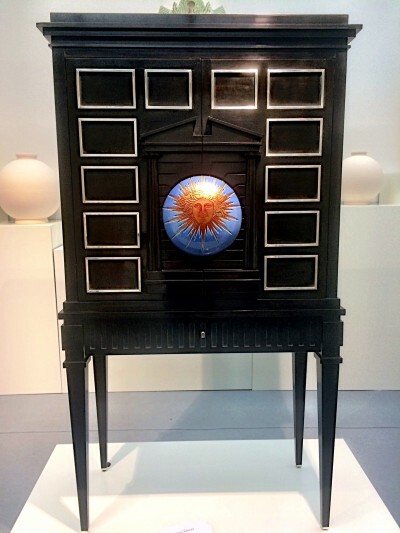 I particularly liked the triptych form with the larger central panel – a form not often seen in screen design. Another piece for my wishlist! While talking to the lovely people on their stand, I learned that Robert Four is one of the last manufacturers of Aubusson carpets and textiles in France. 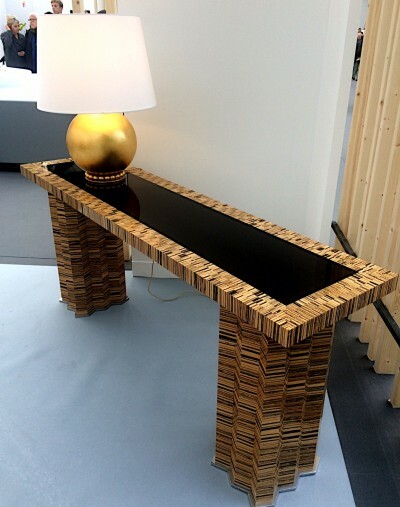 They work closely with clients to produce pieces to the client’s design and also create their own. 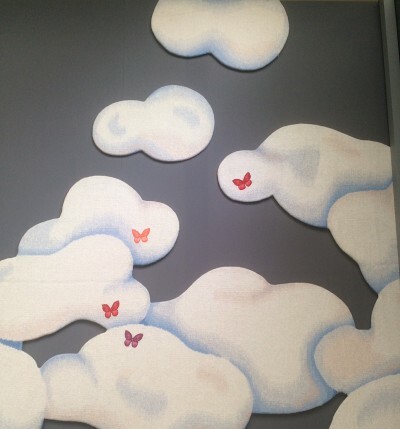 This stunning wall of textile clouds was commissioned by Van Cleef and Arpels, designed by Jean Baptiste Auvray and produced by Robert Four. Again, I was so impressed with the collaborative creative process of the designer with the artisan. Maison Charles, founded in 1908, have their atelier on the outskirts of Paris and have long put great emphasis on the key position of craftworkers and artisans in the creative process. 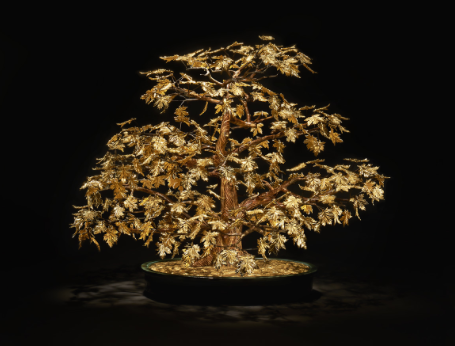 At Revelations they were showing this exquisite Bonsai Gingko Biloba tree in bronze and gold leaf by Pierre Salagnac who is the chef de l’atelier and chef de projet at Charles. The work is breathtaking with painstaking work on each of the 380 leaves. This piece is No 1 of 3 produced. 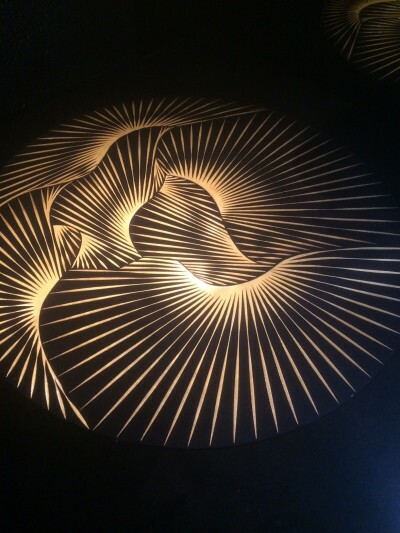 The ‘Intensité’ art carpet in black felt, 22 carat gold leaf and resin is by Celine Alexandre. I find it bold, innovative and sensual and adore the idea of walking on gold (which is obviously made possible by the resin finish!). 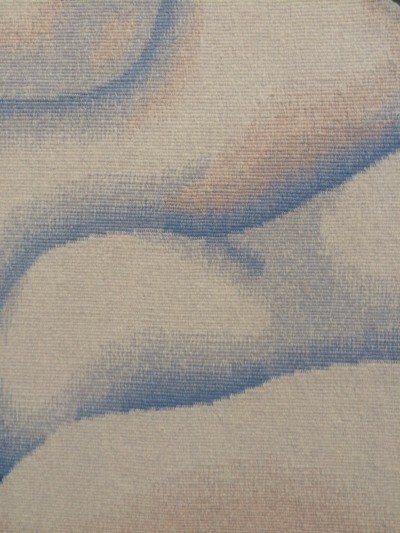 The creators have been involved in textile design for Haute Couture since 1990 and you can see this cross-disciplinary inspiration in these art carpets. Exquisite! Founded in 1960, Mériguet-Carrère are specialists in painting restoration, trompe l’oeil techniques, decorative panels in leather, gold leaf, eglomized glass and many other decorative techniques. 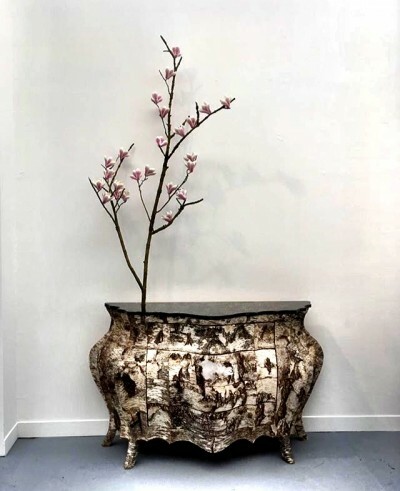 In their atelier they have a large stable of expert artisans working side by side and pride themselves on maintaining and continuing with the traditional methods while also incorporating contemporary elements in their commissioned work. They have been involved in the restoration of La Galerie des Glaces at Versailles, and the foyer at Opera Garnier among other projects, and painted the Nymphea wall decoration for Pierre Berger and Yves Saint Laurent’s house in Deauville (supervised by Jacques Grange, it was produced on canvas in their workshop and then mounted in situ). 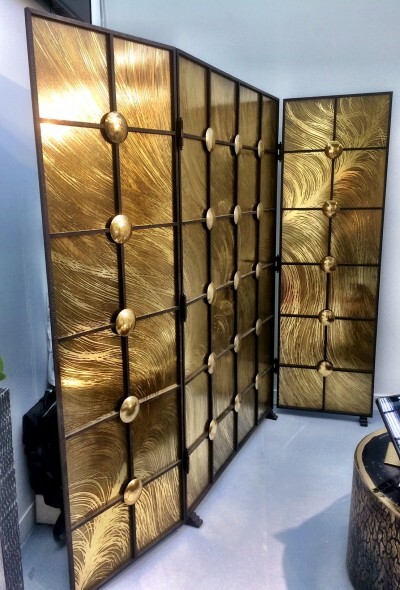 At Revelations they are showing this gorgeous screen in the Art Deco style of Armand-Albert Rateau which they created on wood with hand applied gold leaf. They will work in collaboration with clients to make possible an idea, and also produce their own designs. The people on the stand were fascinating to talk with, and I spent ages with them! Here are some more images of pieces at Revelations for you to enjoy. This is really an exceptional fair and I highly recommend a visit if in the vicinity. The fair runs through to 8 May. 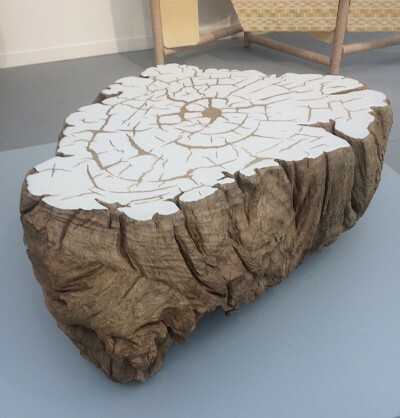 I love the organic work of Birchbarkfurniture. They work with antique pieces and overlay marquetry birch bark onto the surface. I’m a big fan.